The 2.8 Vee Crown Gem Plus utilizes the company’s proprietary Silica Compound. The Vee Crown Gem Plus is designed to handle everything from all-mountain shredding to endurance XC racing. Taller side knobs improve cornering control, while a lower profile center knob pattern helps maintain speed. The Vee Crown Gem also boasts what the tire maker calls its Synthesis sidewall, where a specially woven lightweight layer gives additional puncture and cut protection. It’s a design adapted from Vee’s road tire line and is lighter than their standard MTB casing. 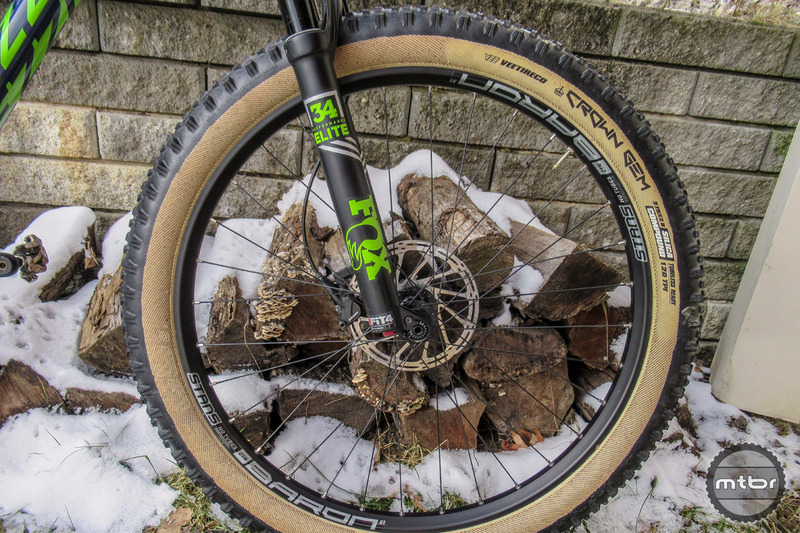 Vee Tires burst onto the bicycle scene in 2013, producing everything from fat bike to road tires. Every subsequent year, Vee has built-up and refined its tire offerings, expanding on compound choice, sidewalls and tread. The Vee Crown Gem is a perfect illustration of this progress. Synthesis Skin sidewalls add flare and an anti-abrasion layer to the Vee Crown Gem Plus. The Vee Crown Gem Plus tested here features Synthesis Skin sidewalls and Vee’s Silica compound. The Synthesis sidewall consists of a tightly woven lightweight layer that gives additional puncture and cut protection. Vee adapted this from its road tire technology. Meanwhile, the Silica compound comes from Vee’s car and motorcycle tire expertise. The rubber maintains performance in colder conditions, and the soft material keeps rolling resistance low. It has a rating of 57a. 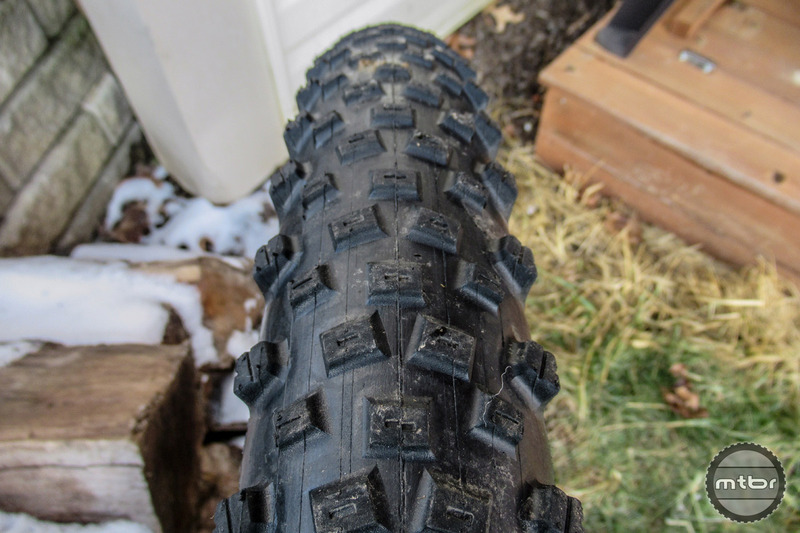 Also be sure to read the Mtbr review of the 29×2.2 Vee Crown Gem cross-country tire. Plenty of bite on the Vee Crown Gem Plus. Out of the box, the Vee Crown Gem Plus have a glossy look. The sidewalls are thick, but silky smooth inside and out. I’m personally a big fan of a skin sidewalls, and Vee executed this with flying colors. These Crown Gems were tested on Stan’s Baron wheels with an internal rim width of 35mm, helping the tires achieve maximum girth at 27.5×2.8. I was taken back by how rounded the knobs were, not sharp like similar tires. The progressive side knob is a nice touch, considering the tight and shallowly siped center line tread. The bead is tight and set-up tubeless without a compressor. We had no issues with tubeless set-up. On my initial rides on the Vee Crown Gem Plus I inflated the tires to around 14 psi. In damp conditions this was perfect, and it ended up being my go-to pressure. Anything higher and I would lose traction in corners. Anything lower and I was hitting the rim on hard impacts. But at my golden pressure, the Vee Crown Gem Plus possessed a terrific ride quality. I found them to be most at home on flowing, groomed trails. On more technical descents and punchy uphills, I’d have preferred a touch more grip. The reduced traction was due to knob angle and their tight spacing. Perhaps Vee’s more grippy Tackee Compound would fare better in these conditions. But what the Vee Crown Gem Plus lacked in cornering traction it made up for with lower rolling resistance and a plush ride feel. Plus I found myself looking at my bike and smiling at the cool looking side walls. Bottom line, the Vee Crown Gem Plus is a reasonable option for anyone looking to dial up the aesthetics and plushness of their plus bike ride. However, I’d like to see a Skinwall+Tackee version to see if grip improved. 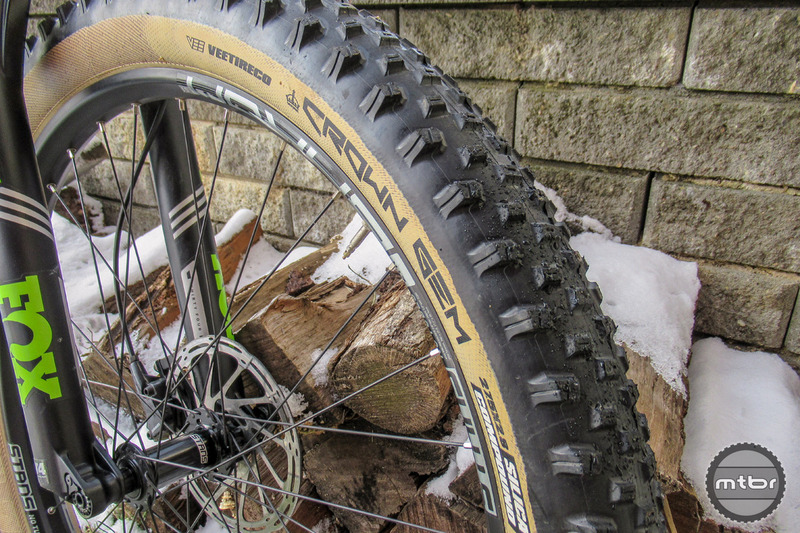 Vee Tires Crown Gem 2.8 tire utilizes Vees proprietary Silica Compound. Synthesis skin sidewalls add flare and an anti-abrasion layer to specific Vee Tires. A riders eye view of Vee Tires Crown Gem. Front view of Vee Tires Crown Gem 2.8 tire. That is one horrible tire profile. Too round, knobs lack the necessary height to get the ground. For a 2.8, these are a wide tire. I had them on WTB Scraper i40 rims, and they actually measured 3″ wide. I was happy with the volume and the traction, but I started having cornering knobs tear off of the rear tire around 100 miles in. After 300 miles I had lost some on the front as well. By 400 miles the rear tread was worn enough and the spots of exposed casing where the knobs had torn off were fraying enough to merit replacement. Despite the fact that they didn’t last very long I would have gone with them again if not for the issue with the cornering knobs ripping off. Not sure if if’s a manufacturing issue or design defect, but it’s too bad. I replaced them with a set of Maxxis Rekon 2.8 EXO 3C MaxTerra 60-tpi skinwall tires. The rubber on those seems a little more durable, but I pinched flatted the sidewalls on both of them right away running them at the same pressure as the Crown Gems. 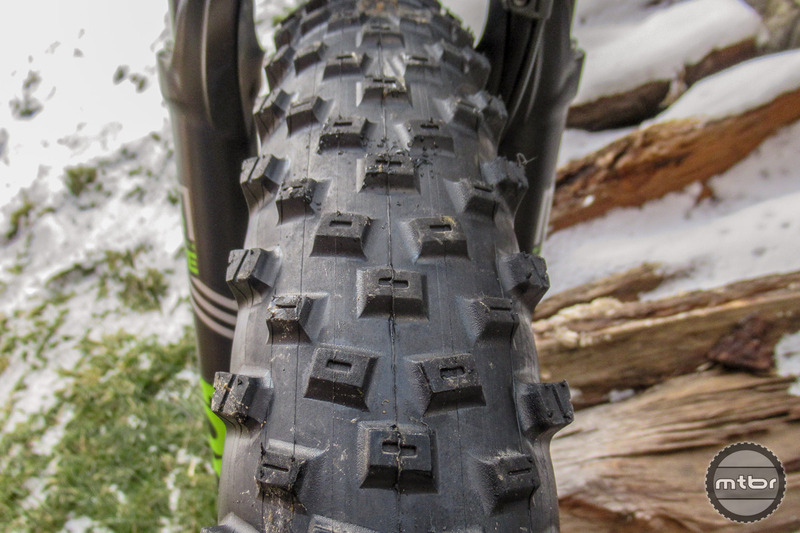 The Maxxis 2.8s measured a little under 2.8″ wide, and needed a slightly higher pressure.